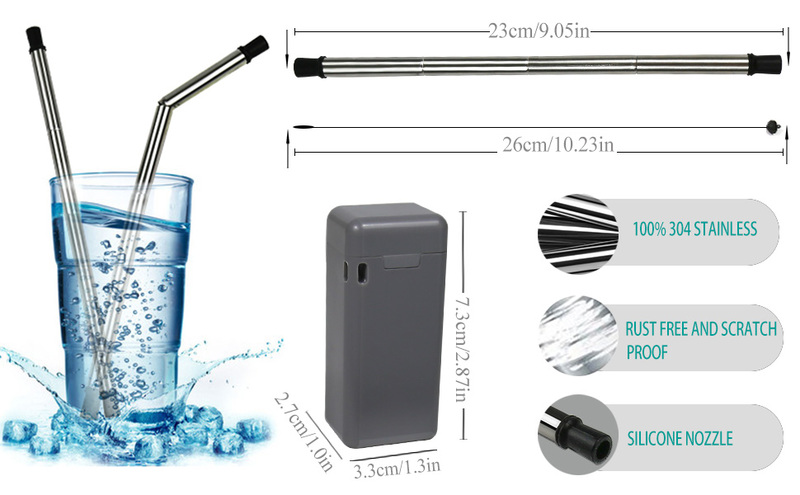 The world’s first collapsible, reusable straw is finally here! Following in the footsteps of single-use carrier bags and disposable coffee cups the government is waging a war on plastic straws. Collapses into a keychain-sized recycled ABS carrier which can be hooked onto your keyring for access whenever you need it. When extended the straw is perfectly sized to fit in cocktail glasses. Reusable, You can use these straws again and again instead of throwing away plastic ones and damaging the environment. Easy to clean and dishwasher safe. Rust proof and they won't shatter like glass straws. Environment pollution is always a worldwide topic that everyone is talking about. Our planet is becoming more and more polluted with plastics. There are over 500,000,000 plastics straws consumed and abandoned in America every single day! Believe it or not, that equates to 2.5 times of earth’s circumference. These plastic straws will be mostly be thrown into the ocean and caused uncountable deaths on turtles and other ocean animals. Alpha Manchester is dedicated to finding the best solution to tackle the problem of plastic pollution.We call on everybody to refuse plastic straws.